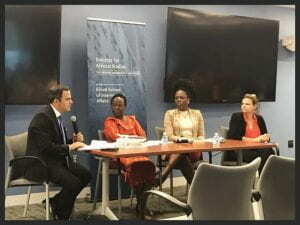 On September 10th, Dr. Alain Tschudin, Executive Director of Good Governance Africa, discussed GGA’s new book Extremisms in Africa. IAfS Associate Director Amb. Liberata Mulamula and Visiting Scholar Jennifer Obado-Joel provided commentary, and IAfS Director Jennifer Cooke moderated.